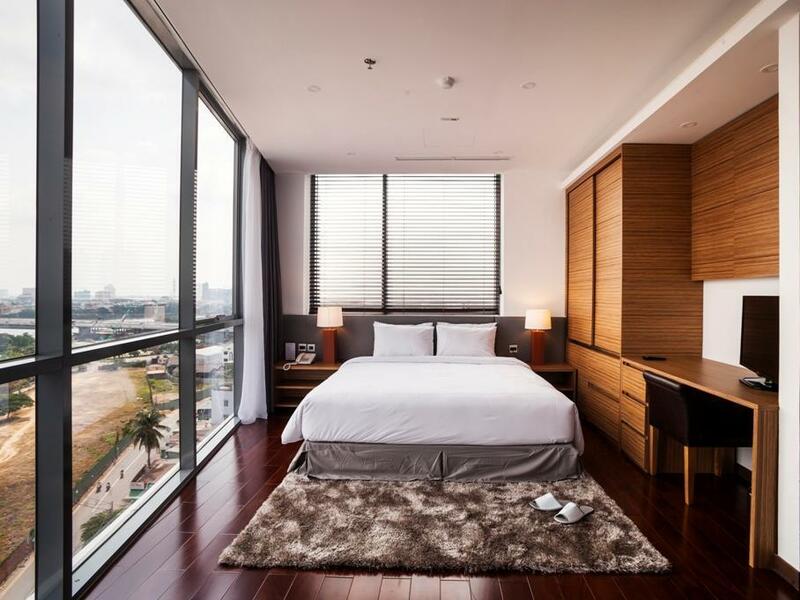 Имате въпрос към Charm Suite Residence Saigon? Charm Suite Residence Saigon е предпочитан както от пътуващите по работа така и от туристите заради качествения и удобен престой, който предлага квартал разглеждане на забележителности на Хошимин Сити. Само на 6.5 km от градския център- това стратегическото местоположение на хотела гарантира на гостите си бърз и лесен начин за достигане до интересуващите ги точки на града. С удобното си местоположение хотелът предлага лесен достъп до всички градски забележителности, които задължително трябва да се видят. Възползвайте се от богатството на ненадминатите услуги и удобства в Хошимин Сити. За удобството и комфорта на гостите хотелът осигурява безплатен WiFi достъп във всички стаи, 24-часова охрана, ежедневно почистване, таксиметрови услуги, 24-часова рецепция. Гостите на хотела могат да изберат една от 67 стаи, в които се усеща атмосферата на спокойствие и хармония. Хотелът разполага с множество уникални възможности за отдих, като например фитнес зала. Насладете се на несравнимото качество на услугите и престижното местоположение на Charm Suite Residence Saigon. Обектът предлага шатъл транспорт до близките райони. Свържете се с обекта за повече информация. Интерьер отеля супер. есть все необходимое. комната очень большая 3х зонная. вкусные завтраки. район не очень. в пешей доступности есть торговый центр. где можно вкусно поесть. A great location for my business trip, staff and overall service is very good and attentive. Breakfast was above average and there is more than enough choice. The room was very spacious and had all I could need, starting to get a little tired but overall it a nice experience to stay there and I would be happy to retun. As every year I book this hotel for my trip. I was disappointed this year, since owner and management has changed. Room quality is very reasonable, but do not expect a high quality service. Staff try to be friendly, but seem not to be qualified for the job!!! I will not book this hotel again. What a pity! I book the residence suite. Very roomy at 59 square meters, it has 2 bedrooms. The secondary bedroom does not have aircon vent in it, but rather draws in the cool from the living area. This is a very silly design. Luxurious and elegant bathroom lined with marble stones. Strong wifi signals inside the suite. Kitchenette is furnished with microwave, pot & pan. Glasses , bowls and silverware are also provided. However, there is only 1 fork and 1 spoon , plus 1 knife. There should be 2 of each. The LG washer included is super quiet, but it is only a simple washer--not the washer/dryer combo I saw in other places. No detergent is given, so you need to buy it yourself, too. Gorgeous bathroom is only furnished with 2 towels. No washcloths given. Only 1 tiny bottle of shampoo and 1 tiny bottle of wash gel are given. I stayed there for 3 night and the 2nd day they did not refill nor give me any extra ones. I had to use those taken from the previous hotel for the rest of my stay. Took a Residential Suite this trip. It is situated at the corner of the 8th floor with a very nice panaromic view of the river from the room. The suite comes with TWO rooms. The main room with a queen bed has an independent climate control, while the smaller room has a Super single and depends on the air conditioning from the living area. The kitchenette is well design and equipped. The only downside is that the toilet does not have a bath tub for those that would like to soak in one after a tiring day. Otherwise, a great suite and good value for money. Will go for it again in my next trip. Everything was pleasant about the stay. Little Improvements can be made though. 1) Shower room floor is marble material but there is no anti-slip mat, can be slippery during shower. 2) Wifi is abit unstable at times 3) Breakfast spread can be a little more variety 4) The toilet slide door can be made better in such a way that it is easier to close and will not have any lighting coming out from toilet at night during sleep if guests were to turn on the toilet light during sleep. Accessible everywhere by taxi. Airport shuttle charged at USD22/way/car which is considered quite reasonable especially if you have more people on board. Facilities are quite limited - there is only a gym. Maybe can have more facilities like spa / ,massage / swimming pool / suana in future. Overall, it was an enjoyable stay. A very cosy kind of service apartment that makes one feel home. Buffet spread for breakfast was rather limited but still acceptable. Having breakfast at the roof terrace was a pleasant one where you can see the view of the Saigon River. Security staff and hotel staff are all very friendly and helpful. Very comfortable and clean rooms with great ambience. Rooms are big and gave a homely feel. Not the kind of location near to city centre but still accessible to food / minimarts and shopping mall like Pearl Plaza. About a 30mins ride from Airport to Charm Suite. Staffs are friendly and know how to communicate in English. They have been of a great help to us for our entire stay. We chose this for the apartment style, and were very happy with this decision. The apartment size was good, the view from the room was great, the curtains made sure no sun light came in so we had some reallt good sleep. Location wise is great if you are looking for somewhere quiet although a cab ride out is the only way to town but cabs are cheap and the hotel will always get a cab for you. On one occasion when a cab driver was lost driving us back, we called the reception for help and two of them were standing at the entrance waiting for our cab to arrive. One of them accompanied us back to the lobby while the other talked with the driver, to make sure we paid a reasonable price for our ride, instead of what was on the meter. If I were to go back HCMC again, this is one place I will gladly stay in again. Staff very helpful, particularly Enna at reception: very good English, very efficient; gracious and effective. Breakfast good. Plenty of choice. Spacious room. Functional. Good view of river. Location is away from the touristy area; so this is real Saigon, much more interesting than District 1. Charm Suite is nice to stay with spacious room and comfortable. Only the location of the hotel is a bit out of town. Good services provided by the staffs and Manager. The Manager very polite, friendly & attentive! Very enjoyable stay at this hotel. Although it is not located right in the center of Saigon but the room quality can be as good as some of the 5 star properties in town. 15 mins by car will bring you to the center. We enjoyed the view a lot since we booked an 1-bdr apartment with direct view to Saigon river. The view was marvelous from bedroom's window. Room service was good at quite reasonable price. The building is located very close to a convenient store which is quite easy for us to buy stuff for our meals. However, since it is an apartment, it would be better to be equipped with more cooking utensils, shower area also needs a sliding door. The hotel is a new, korean boutique hotel in the Binh Thanh district. It is more of a 3* than 4*. The rooms are clean and the bed is comfortable. The location is a bit off district 1, where all the attractions are, so expect to be taking the taxi quite a bit. Service was overall good, the staff spoke well enough English and were pretty helpful. Actually, the hotel need more facilities for suite room (with kitchen). We did cooking at the room but they didn’t provide seasoning, washing sponge and dish soap so we had to buy ourselves (just used a little bit).